makes high-fired, hand thrown ceramics in the picturesque village of Tobermory on the Isle of Mull with designs inspired by the West Coast of Scotland. Established over 25 years ago, we have built an international reputation for quality ceramics, and now have expanded to include a Gallery and Café/Bistro. Come with us and experience this unique world of rich seas, whales, dolphins, sharks, puffins, seals, birds, gannets, castles, and so much more. All set amidst the wonderful scenery of the Inner Hebrides. Everyone is welcome, and entry to the centre is free. We now have a little Cafe' and serve Teas, Coffee and drinking chocolate as well as yummy cakes and pastries. And of course, if you have the opportunity, please visit the island blue gift shop in Tobermory, Mull. Visually exciting and colorfully inspiring, the shop is a venture we are very proud of as it is the physical embodiment of our passion for life! 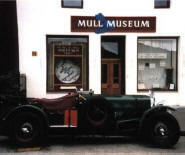 is a small local museum packed with artefacts about the Isle of Mull from its geological beginnings to the present day. The Museum boasts an extensive collection of photographs, which can be searched on computer. There is a well stocked local history library and archives which are open to members and bona-fide researchers. 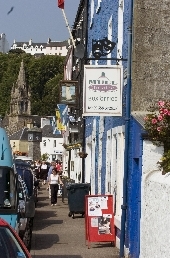 is situated on Main Street, next to the Mishnish Hotel overlooking Tobermory Bay. We provide a full range of hairdressing and health & beauty treatments in a calming atmosphere. Why not come and be pampered? 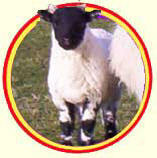 If you're visiting Tobermory on the Isle of Mull, why not come and spend some time at the Tobermory Open Farm? We can be contacted after 5pm on 01688 302941 or email. is now closed. Our administration office is now situated at Druimfin, a mile or so outside Tobermory on the Salen road. This is where our new production centre will be built. Druimfin, Tobermory, Isle of Mull, Argyll PA75 6QB. On Mull, our shows will tour to village halls as part of our national tours. These venues have full disabled access. The home of "Isle of Mull Cheese" is a small family farm situated on the beautiful Isle of Mull, in the Inner Hebrides, off the West Coast of Scotland. How to find : One kilometre south of Tobermory on the A848 look for a rough road on the right at Baliscate. You may wish to walk up this road rather than drive it. The stones are visible in the field to the right after 400m. (Site also referred to as 'Tobermory'). Best time of year to visit : Any clear night or midday. The park is very well maintained by Forest Enterprise and has been developed as a recreational woodland. The company has gone to a lot of trouble to provide good parking, disabled access, clear, unobstructed paths, barbeque facilities and toilets. All these are free of charge. 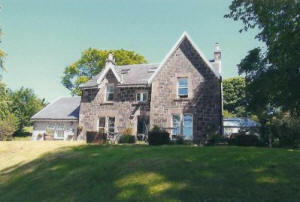 The park is on the site of Aros House, and the Allan family developed the grounds during the period of 1874 to 1959. The house was unfortunately demolished; however, the heritage of this magnificent woodland remains. There still remain some buildings associated with the house, for example, the generator shed by the stream which gave power to the house. The walled garden below Glengorm Castle has been run as a market garden for the last 30 years, and is renowned locally and further afield for the quality and variety of its produce. The garden supplies fresh vegetables to many of the hotels, restaurants and shops on Mull as well as the Glengorm Coffee Shop. Discerning gardeners can choose from the wide range of shrubs and herbaceous plants on offer, which include unusual and collectible varieties. Visitors are welcome to enjoy the gardens and lawns on their visit. Our shop is situated at Glengorm, approximately 4 miles from Tobermory on the Isle of Mull. Next door to the Glengorm Coffee Shop and Art Gallery. Owners Graham & Sally Bruce- Richards are both professional artists with their working studio at Druimard. Our daily wildlife expeditions have blazed the trail in wildlife watching for over twenty five years here and they are a must for any wildlife enthusiast visiting Scotland at any time of year. Guided visits to a hide with views to the nest area of a sea eagle will be available from April to mid July. The hide opens on Monday, 2nd April 2007. Bookings are essential (from 19th March) on 01688 302038 and to avoid disappointment should be made several days in advance. This year's Wild Isles Week will take place on 5th - 11th May. Details of this year's events are still being finalised and this website is updated regularly. If you would like to be notified of updates, please email passport@wildisles.co.uk to be included on any email bulletins. This site also runs a diary of events happening on Mull throughout the year. This is Scotland's original island passenger railway. The terminal at Craignure is reached by the 80 car/1000 passenger Isle of Mull ferry from Oban and the crossing is only 40 minutes. Oban lies just over 100 miles (160 km) from Glasgow on Scotland's west coast. The Railway Timetable links in with most ferry sailings. 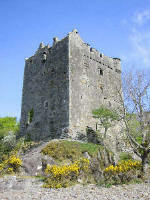 on the Isle of Mull in Scotland is the ancestral home of the Clan Maclean. Discover the history of the Castle and the Macleans, learn more about other visitor attractions on Mull and Iona, and visit our online gift shop to purchase from our wide range of gifts and Scottish merchandise. The remains of Moy Castle can be found along the shore from Lochbuie. It was the stronghold of the MacLaines of Lochbuie, descended from the Macleans of Duart. The castle and the surrounding area is said to be haunted by the 'headless horseman' Ewen a'Chinn Bhig, son of the Chief of the MacLaines. A battle between father and son led to Ewen's decapitation, his ghost - on horseback - is said to ride furiously around the castle! The remains of Aros Castle, another of Mull's medieval castles, are located at Aros Mains, a couple of miles north of Salen. It was a stronghold of the Lords of the Isles.